Our last tour of Ghana (before heading back to Accra) included visits to the various surrounding villages of Kumasi. The villages chosen were Ahwiaa, Ntonso, Adanwomase, and Bonwire. Each village is presently and has traditionally been linked to a handicraft to which it specializes - wood carving in Ahwiaa, adinkra cloth making in Ntonso, and kente weaving in Adanwomase and Bonwire. We were met by Fred and Benson our guides for the day and we headed out first to Ahwiaa. 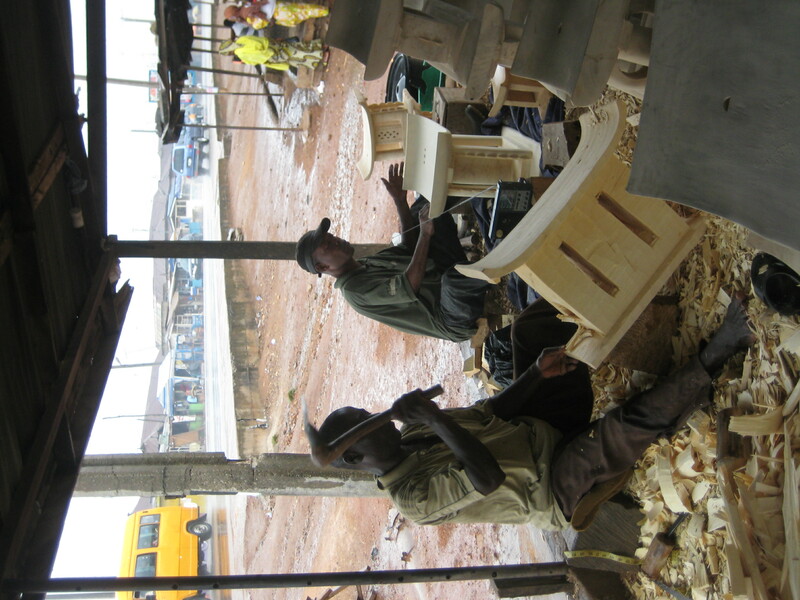 Our first stop was Ahwiaa to see how handmade wood carvings are still traditionally made, including the stools for the royal family of the Ashanti. We were introduced to the leader of the village's main workshop, who welcomed us to see how all different kinds of objects are handmade. There are no sophisticated tools in the shop, just talented men with chisels of various sizes carving away at hunks of unformed white and red cedar to make their creations. I will post a video once I'm back home so everyone can see just how busy this workshop was. Just from looking in the shops in the village, the workshop does incredible work (and of course we had to buy some carvings to take home)! Our next stop was Ntonso, a place I was excited to visit in order to learn more about the adinkra cloth that was made there. Adinkra are the symbols that carry significant meaning in Ashanti and Ghanaian culture. 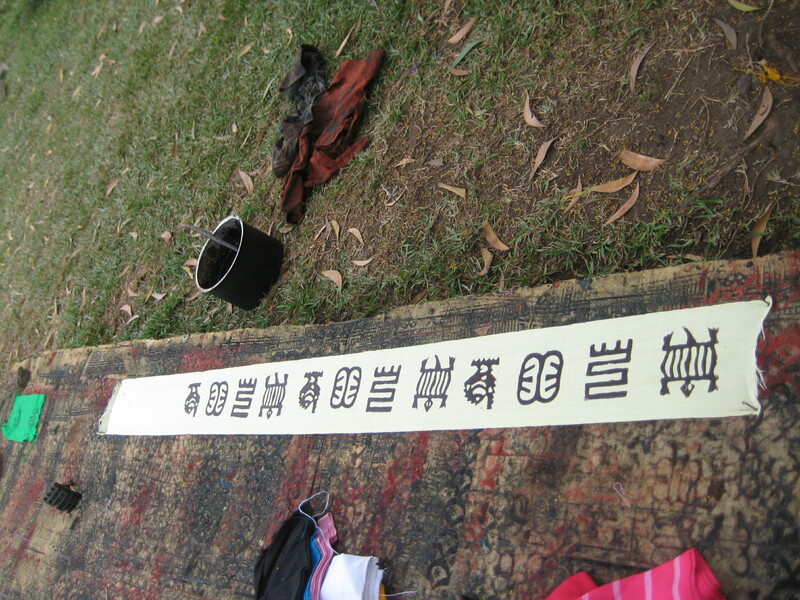 The act of stamping these symbols on to cloth represents the communication of the messages embedded in these symbols to those that have passed into the afterlife. While these cloths were often worn at funerals (and still are), the craft also has lighter themes and colors too! Ntonso has a lovely visitor's center where were shown the production process of making adinkra. We saw the process of pounding bark to make the dye (quite a laborious effort! 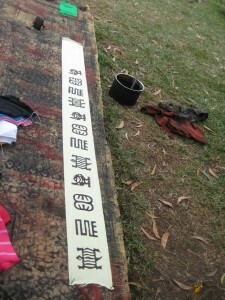 ), where the pounded bark is then sifted and boiled and stirred to create the distinctive blackish dye used in stamping. The last step of course is the stamping, using hand carved stamps made of calabash, and we got to try this out for ourselves, choosing our own cloth, stamps, and pattern! The symbols I chose were the crocodile (symbolizing versatility because a crocodile lives on land and in water), the zig zag (that represents changing with the times), the symbol called "ese ne tekrema" (representing friendship), and the crane with its neck pointed backwards to itself (called "sankofa" this represents the importance of remembering your past). You can see the (almost) finished product in the picture. I also thought my Fund for Teachers bag could use some andikra too! We bid farewell to Ntonso and headed next to Adanwomase, the village most famous for weaving the kente cloth of the Ashanti royal family. The town also has a pleasant visitor's center from where we led on a tour of the kente weaving production process, the town and its local shrine, and the nearby cocoa farm. Our guide led us on an informative and interactive tour of all aspects of making kente, from spinning the thread, to "warping" the thread (this picks the colors and organizes the design), to finally weaving the cloth itself. The production was the most fascinating to me. The all-male weavers worked in an outdoor workshop (it's actually the old market, abandoned by the women for its bad location, but soon-to-be-again market once the indoor kente workshop is complete). All were no more than 22 years old, and one boy looked much younger than that, and all worked at an incredible space. The designs were well memorized because any mistake in just one level of weaving would ruin the whole cloth. The atmosphere seemed positive and light, not what you would imagine a textile factory/workshop to look or sound like. I'm sure that the weavers of Adanwomase would stack up with any weavers in the world for their speed and accuracy in completing cloths! We finished with a tour of the village and cocoa farm. We visited the town's sacred tree (where it takes its name from) and the local shrine, although the local priest was absent. At the cocoa farm we received an explanation of how the country's second largest source of economic wealth is harvested and produced, and then we tried some of the seeds of a cocoa pod - very sweet and tasty! We said goodbye to Adanwomase, but unfortunately were unable to visit Bonwire because of time. However, Fred and Benson did insist on taking us to what Fred considered the "best fufu" spot in all of Kumasi (and I assume for Fred, all of Ghana). We agreed, and Fred ordered up for us a piping hot bowl of fufu (a pulverized blend of plantain and cassava that is smashed until it becomes this gooey ball) with goat's meat and fish in light soup. Fred made sure to show us the proper technique - use your right hand, only the fingers, pick out a piece of fufu, dip in sauce, and eat without swallowing. The soup was a whole lot of spicy goodness, and the goat was tender. Fufu sure seems like it would take a lot of getting used to, but I'm glad that we tried it in the end. We finally said goodbye to our now friends Fred and Benson, exchanged email addresses and phone numbers, and promised to stay in touch. I found that today was especially meaningful because it gave me such an important peek into the rich cultural history and traditions of the Ghanaian people. Much of this trip has been devoted to documenting the disturbing history of the Atlantic slave trade, and the visual reminders that remain today on the Ghanaian coast, but of course there is so much more to this country than its sordid past in that "peculiar institution" - it is a proud nation with an incredibly resilient people that can claim to becoming the first independent African nation (in 1957), but also still struggles with many of the same poverty, health, and environmental issues that developing nations all over the world today face. 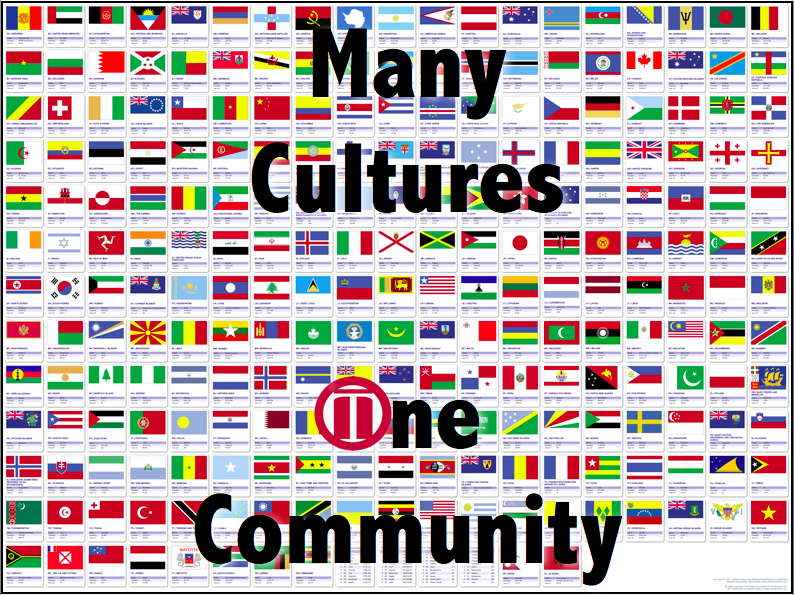 They are so clearly a nation that has dealt with European contact for over 500 years, but also one that has steadfastly maintained it's strong customs and traditions. It is a place that is at once so familiar to me, but also a place that requires more time and examination to fully understand it (perhaps an impossible task for one lifetime). I have very much enjoyed my experiences here in Ghana because it has opened up so much more to me about how people can teach and learn in different parts of the world, and that by no means does the Western world have all of the answers. 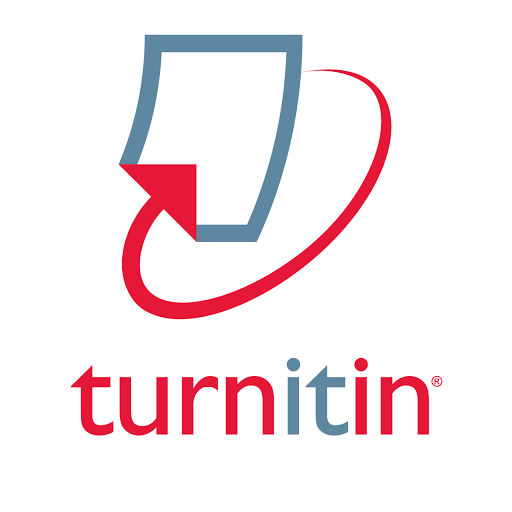 I think that if I can incorporate a fraction of what I have learned here, my students will be so much better for it. Kumasi is home to one of the largest markets in West Africa (claimed to be the largest, Kejetia Market is approximately 12 hectares in size) – and to be fair to Kumasi residents, the claim must be true because almost all of the city feels like one huge open air market! The roads are narrow and crowded with bumper-to-bumper traffic and on either side hawkers sell their wares from all corners of the country and beyond. 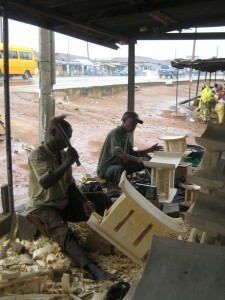 One is constantly reminded of Kumasi’s central nature in the vibrant trade going on in Ghana. Neither can one forget for one moment about the history, tradition, and power of the Ashanti. At a time when European contact was increasing their contact with West Africans along the coast, the Ashanti were gaining power in the central region of Ghana, expanding their empire through conquest stretching even present-day Ghana’s borders to make their empires one of the largest and strongest in West Africa in the 18th and 19th centuries. In the process, they controlled the lucrative trade routes that went through Kumasi and ultimately to the coastal regions, which included the most lucrative trade of the time – slavery. Just as then, Kumasi remains important for its rich cultural and political history, and its centrality in the trade coming through the city from all corners of the country. Today we decided to start our visit by walking to the National Cultural Center, a large expanse devoted to displaying Ashanti artisanal arts and culture. 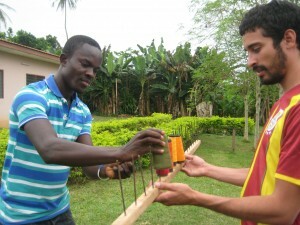 The center gives a nice overview of the different traditional Ashanti trades that are still practiced and maintained today. Inside the well-manicured grounds is the King Prempeh II Jubilee Museum created to display the many artifacts of the Asantaehene from 1931-1970. Our guide gave us an excellent tour of the small museum that covers most of the items used in royal life, also explaining the politics of the Ashanti. There are wonderful photographs, and the artifacts demonstrate the immense wealth of the Ashanti royal family, which would have rivaled any European royalty in the 19th century, to be sure. Tomorrow we plan to tour the various artisanal craft villages that surround the Greater Kumasi area to see the traditional techniques of the wood carvers, sculptors, kente cloth weavers, and Adinkra (cloth with dyed and stamped patterns). I will update on how that visit goes! Stay updated right here! At 9 in the morning yesterday we were picked up by our friend and driver Ben to see three very different and distinct west of Takoradi - Fort Gross Friedrichsburg in Prince's Town, Fort São Antonio in Axim, and Fort Apollonia in Beyin. The first stop was Prince's Town which requires traveling along an 18 km. stretch of one of the most treacherous dirt roads we've seen in Ghana so far. Fortunately, Ben's skilled driving got us to Prince's Town safely. Our tour guide Matthew met us at the base of the hill and we walked up to the fort. 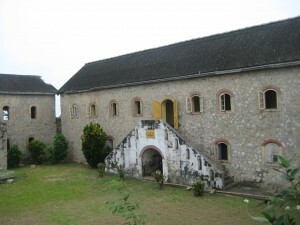 It is distinct in Ghana because it was the only fort built by the Germans (actually the Brandenburgs) there. It is also distinct because it doesn't look like any of the other castles or forts, more like a country villa for a royal family. Much of the building is ruins after it was destroyed by the Dutch in their attempt to conquer (which they finally did). The building now is used as a resthouse with several rooms (there were two guests enjoying the sun on the southwest bastion when we visited). Our next stop was then Fort São Antonio in Axim, the second oldest fort in Ghana built in 1515. Unlike Elmina's castle, which is considered the oldest European building in Africa built in 1482, this fort is largely unchanged since it was first built and remains in solid shape, despite its less than stellar treatment by the Ghana Monuments Board when compared to Cape Coast and Elmina (when President Obama visited Cape Coast, the Ghanaian government demanded that the museum displays at Axim be moved to Cape Coast, which for some reason still haven't been returned). Our guide led us on an informative and passionate tour, which included seeing inside many of the slave dungeons at this castle, whose residents now include bats and rats! However, I was really struck by the fact that Axim had separate cells for the young slaves that were traded there, children from 8-11 years old! Now this was the first time that any castle tour had mentioned such young Africans being traded and imprisoned within these forts, but perhaps with some more research I can find out whether São Antonio is unique in this regard. Our last stop was in Beyin, a town not far from the Ivory Coast border, and also along a dirt road about 15 km. long. Again, Ben was able to safely transport us there, and we arrived at Fort Apollonia at 2pm. 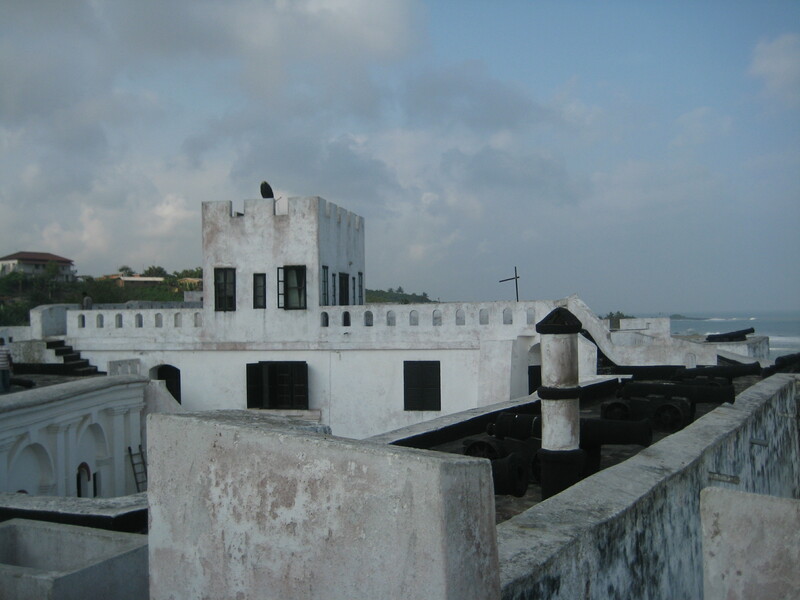 Unlike any other fort in all of Ghana, this fort is being currently used as a museum whose sole mission is to maintain the rich ethnographic history and culture of the Nzema people in the Western Region. 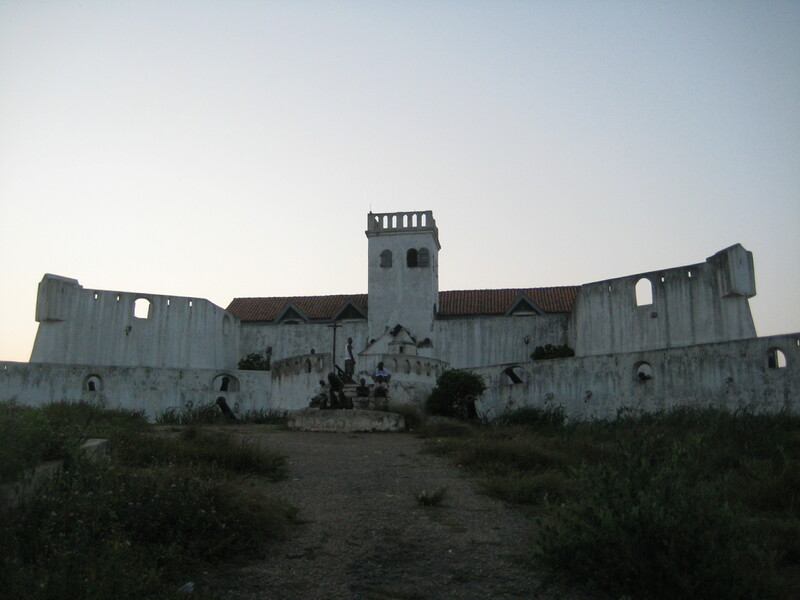 The fort was refurbished thanks to an Italian ethnographer, with the permission of the Ghanaian government. 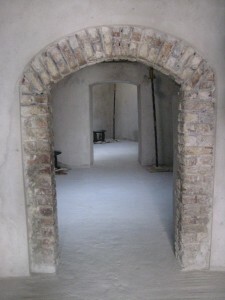 The fort was not renovated specifically to maintain the architectural and historical integrity of the British original (there's a lot of concrete used inside). Our tour, once again, was very informative. She (the only woman to guide us in any of the forts we've visited) was very knowledgeable about the uses of the fort under British rule, but importantly she took us through an ethnographic tour of the history and culture of the Nzema people. The castle is small, and while I was interested in understanding how this small British outpost was used to trade slaves, I found myself much more interested in understanding Nzema history, geography, art, music, genealogy, and politics. In my opinion, this was the most well-maintained and informative museum visited in all of Ghana, so far. What has amazed me about this trip has been to see how Ghanains have adopted and co-opted these various European buildings, all with disgraceful and complicated histories, for a myriad of purposes. While Fort Apollonia is unique today, perhaps in the future more forts will be used to also preserve the local cultures of the peoples living around these castles and forts. Today we head to Kumasi, the capital of the Ashanti Region, one of the most powerful African confederations in the 19th century, a force that was the thorn in the side of many European nations, but also played a difficult role in perpetuating the Atlantic slave trade. I am very excited for this final stop on our journey! After a much-needed and much-deserved day of rest on Sunday, we were picked up Victor once again to guide us to more forts en route to our next base – Takoradi, in the Western Region. Our first stop would be Fort St. Sebastian in Shama built by the Portugese in 1523, but finally seized by the Dutch in 1640. The fort’s architecture is unique in that the forts inner walls are quite weak and required stone buttresses all around it to fortify the structure, leading the fort’s unique (and in my mind Mordor-esque) semi-circular staircase and entrance. 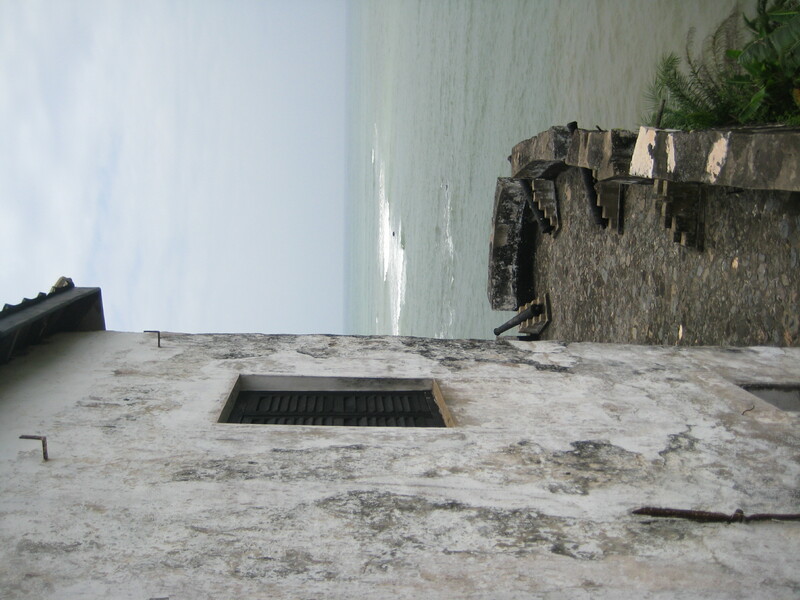 Like Fort Amsterdam, Sebastian does not receive as many tourists as Cape Coast or Elmina and feels less slick. The caretaker took us through an informative tour of the place. Unlike any of the forts that we have visited so far, Sebastian is still used for administrative purposes, including using the female slave dungeon as Shama’s post office! There are also seemed to be several people living in the fort. What continues to amaze me about these forts and castles are the various uses that Ghanaians have employed, whether they be museums and tourist sites, or guesthouses, or government offices. We continued on from Shama west to Sekondi where Fort Orange is located. Unfortunately we were unable to find it, since we had no map of Sekondi, and even more perplexing that no resident of the town seemed to have ever heard of Fort Orange or the lighthouse (its current use today). We decided to continue on to Dixcove, a small town about 35 km west of Takoradi. The village is felt run down and neglected, but sitting on a cliff overlooking the town and the sea is Fort Metal Cross, constructed by the British in 1696, but still today retaining the name the Dutch gave it after they captured the fort in 1868. The caretaker found us wandering around the fort and invited us in to tour the building. The tour included some grim explanations of the site’s original use as cemetery, as well as an oral history of the 10 year-old girl buried alive as a sacrifice to pacify the gods that embodied the land! The fort itself has plans to turn into an upscale hotel, with chalets in front of the fort along the cliffs, a pool facing the sea, and the courtyard turned into a restaurant. All of these additional buildings are still under construction, and rumor has it that the employees would be outfitted in colonial uniforms! Although Dixcove could certainly use more attention, this seems like an unfortunate way to maintain the fort, a place that treated so many Africans as if they weren’t human. 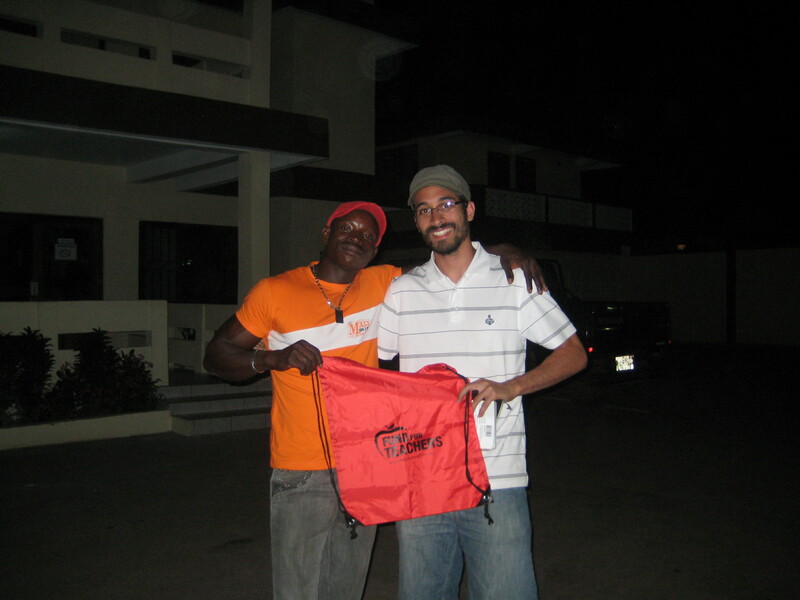 We bid farewell to the caretaker and Victor returned us to our hotel in Takoradi where we could rest up for tomorrow’s adventure through the Western Region! Today was going to be our most ambitious day yet, and so we decided to hire a car to take us to the far-reaching sites of the Central Region. We had Victor pick us up early in the morning. Our first stop was actually within Moree (where we were staying) to see the ruins of Fort Nassau, the first Dutch outpost in the Gold Coast. At the time, Dutch architects only knew how to use Dutch-made materials (like red brick), so the whole structure was made of imported materials, rather than quarried stone from the surrounding area. The road through Moree is a narrow dirt road, cars seem unable to pass through it, but Victor trudged along anyhow. When we reached the top of the cliff where the fort used to stand, Victor asked if we could have a look around. We were welcomed, and the folks insisted that it was okay, but to be honest the whole experience made me remarkably uncomfortable. Only about two or three portions of the large walls of the fort remain, and the whole site is occupied by several families, and I felt intrusive, to say the least. It seems apparent that the Ghana Museum and Monuments Board (GMMB) has not had much interest in Fort Nassau in a very, very long time. We thanked everyone for their kindness, despite the awkwardness, and moved on to our next stop – Fort Amsterdam in Abandze (near to Kormantse). This site has become well known in the United States and the Caribbean for its links to prominent African-Americans and others that have traced their ancestry to this fort – many slaves in the early history of the United States were referred to as “Kormantins” (i.e. from Kormantse) and not Africans. Louis Armstrong apparently traced his ancestry to this place. 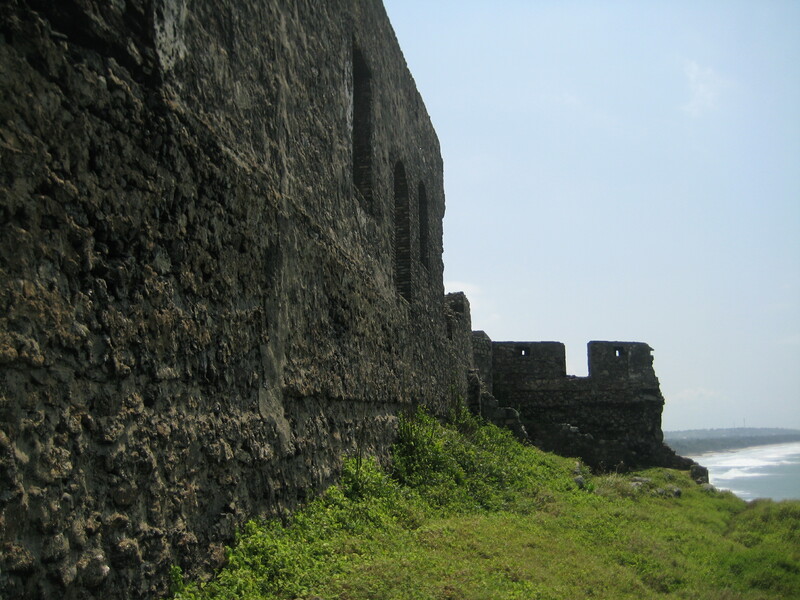 Fort Amsterdam sits on the top of a high hill overlooking the coast from all sides. We walked around the fort, assuming it was abandoned, and content with some pictures of the outside of the structure. However, the caretaker found us wondering around and invited us in. Although parts of Amsterdam are in ruins, like Nassau, much of the building is standing, and it seems the GMMB has shown interest in maintaining this important historical site. The caretaker was knowledgeable and his tour was informative, as he described the conditions of slaves and masters alike at Amsterdam. I enjoyed visiting this site far better than Cape Coast, partly because of the knowledge of the caretaker, and partly because of the lack of crowds, but mainly because Fort Amsterdam allowed me to visualize what was occurring inside, rather than having it visualized for me. At any rate, we said our goodbyes to the caretaker and moved on to visit Assin Manso, a village that is about an hour north of Cape Coast. Assin Manso is not quite halfway between Kumasi and Cape Coast along the main road between those two cities. 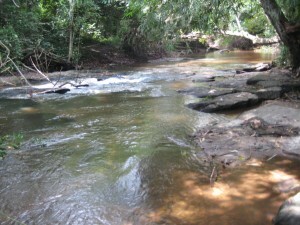 The village’s importance came in the river that ran through it – the last place that enslaved Africans were allowed to bathe before making their final journey to Cape Coast Castle, and eventually the Americas. The site has obviously continued to carry symbolic meaning for Ghanaians and the African Diaspora, and it now contains a small museum, memorial, and burial site for two former slaves reinterred in Ghana to symbolize the African Diaspora’s return to Africa. The museum was closed when we visited, but we were taken on a tour down the path that leads to the “slave river.” There was a strange calm to the trees that overhang the path. I thought about the millions that were chained and forced to walk that portion of the path to the slave market, part of the hundreds of miles they were forced to walk barefoot and dirty. The river itself seems more like a large stream, and the water was clean. I tried to imagine the chaos that would ensue from forcing chained individuals to bathe together in this small river, some perhaps even using the opportunity to attempt their final escape, knowing the slave market and Cape Coast were only a few days march away. I thought that perhaps would have a much stronger connection to the place, as I imagine many people do, but instead I felt that the place didn’t honor those that passed through this place as much as I had expected. Perhaps there really is no way to truly honor such a tragic history. We left Assin Manso to make the one-hour return journey to Elmina, a fishing town about 12 km. west of Cape Coast. The town itself has a colonial feel, and seems to have maintained its character for many years. 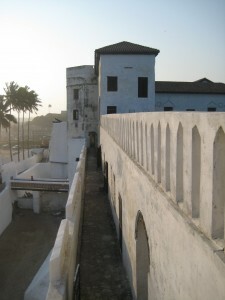 Elmina is also home to St. George’s Castle (or São Jorge da Mina in Portuguese), considered the oldest European building in Africa (although sometimes disputed), erected in 1482 by the Portuguese. 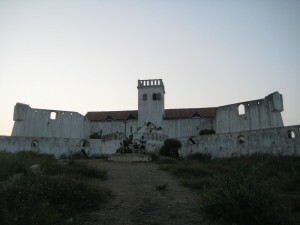 The castle was overtaken by the Dutch, and like all other forts in Ghana, eventually overturned to the British in 1872. 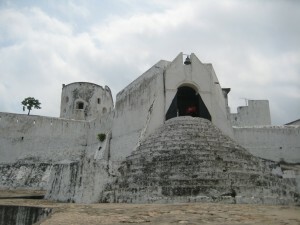 The castle has undergone major changes throughout its history, just like Ghana’s other castles – Osu and Cape Coast. The complex is enormous, four stories tall in some places, and the whole place is full of labyrinthian confusion. We entered the main gate, crossing a drawbridge over a moat to protect the castle from enemies. The Portuguese and Dutch certainly were paranoid! When you first walk inside the vast courtyard, the first thing you see is the church the Portuguese built. And of course, right to the back of you, are the prison cells for “difficult” slaves. Certainly no building we have seen yet shows such a contrast. 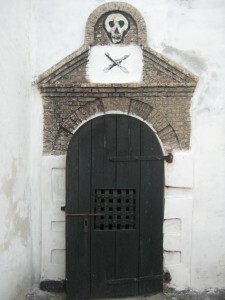 The entrance to the prison cells is morbidly marked by a skull and cross bones (apparently the cell without the symbol meant you would be allowed to live, while the other one meant the prisoners would die inside). We decided to skip the tour to explore the complex on our own. We definitely got lost, and the whole places has a sort of schizophrenic mood to it – a place not able to even explain itself, a place without a proper floor plan or map. The most gruesome part of the castle has to be the male and female slave dungeons. The male slave dungeon is large and probably held up to 200 men at a time, often waiting 3 months for a ship to arrive to take them to the Americas. From inside the male slave dungeon is a small, dark tunnel, grimly marked “To waiting slave ships.” The tunnel itself is not lit and was the only time so far that I actually felt scared – I couldn’t see my hands in front of me, and the tunnel kept getting smaller and smaller. I turned back to the light, something so many individuals weren’t allowed to do. 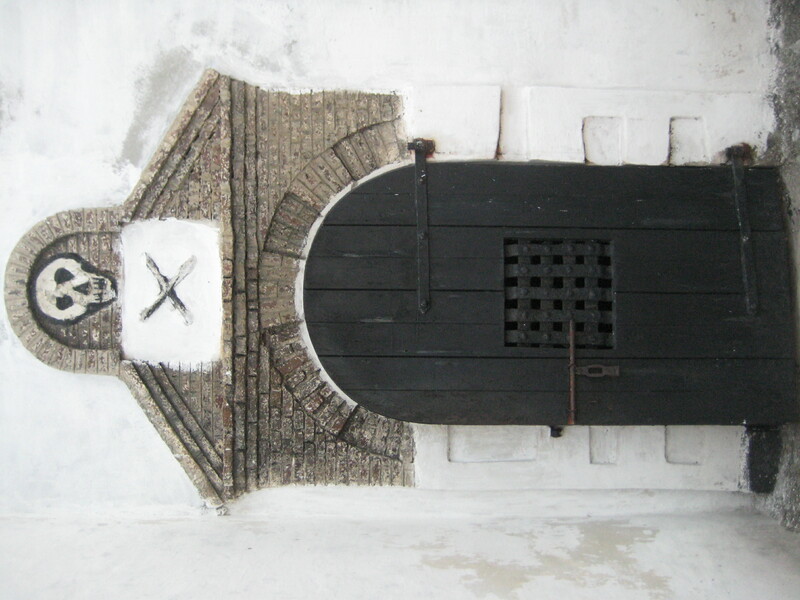 The female slave dungeons were smaller, but no less sinister, all facing a courtyard that opened up to the captain’s rooms, allowing them access to the female Africans below (via a secret staircase). Inside the dungeons was perhaps one of the foulest smells imaginable, one probably not as a potent as it was when the place was still actually a dungeon. I think that one could get spend hours and hours exploring the place, but we had one last stop before sundown. São Jorge da Mina certainly left an impression on me that I won’t soon forget. Our last stop was across the street from the castle and up the Jago Hill to Fort St. Jago, the only fort in the Gold Coast built primarily for military reasons. 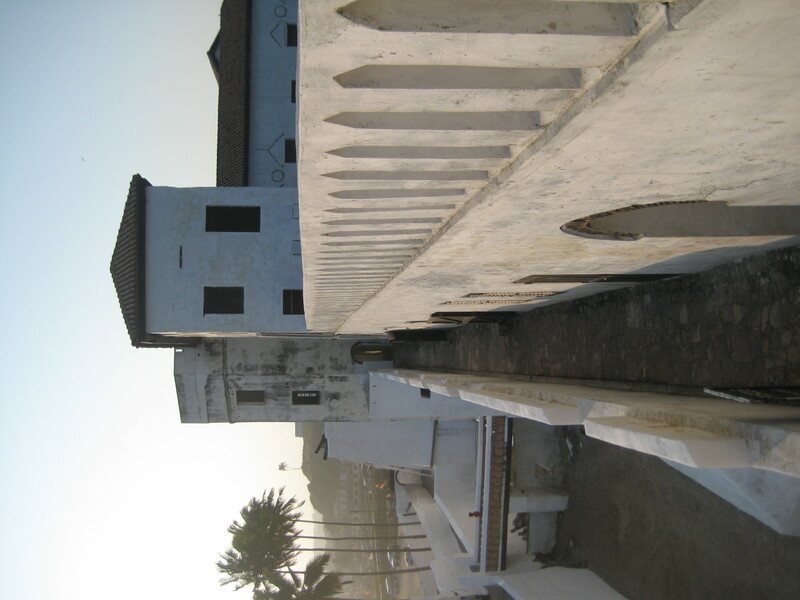 The place was the perfect location to look down over Elmina, and the Dutch used it to capture the castle in 1637. The Dutch wanted to make sure no other European or African power repeated what they had accomplished, so they built a fort on the hill to protect the castle. 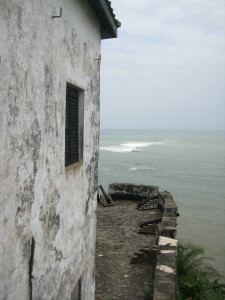 The castle is in decent condition, and the views over Elmina are unmatched. We watched the sun begin to set over the small fishing boats in the harbor. We headed to our new base in Elmina to rest after a long day. Tomorrow is Sunday, a day to finally rest and reflect on all that we have seen and experienced so far. 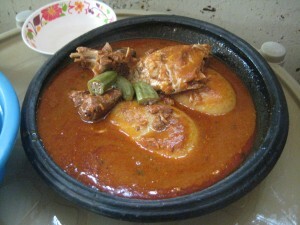 In Twi, one of the indigenous languages of Ghana, "akwaaba" means "welcome." Mr. V has finally arrived in Ghana, spending the previous three days in its capital city Accra. After an 11 hour flight from the United States, these few days have been useful for resting, becoming acclimated to our environments, and enjoying the food and sites that Accra has to offer. Some work has already been done, documenting images for my project at the National Museum, which houses a couple of exhibits and artifacts from the slave trade period (including many interesting items from the slaving ship Fredensburg, a Danish-Norwegian ship of which I have read about in my preliminary research). There also has been a lot of recreation in speaking with locals, including an entire group of primary school students from Unity Prep School in the Central Region (on a field trip to Accra)! There is a lot to see and try, but there will also be some work to do. On Monday, I plan on visiting Prof. Emmanuel Akyeampong from Harvard University at his summer office at the University of Ghana in Legon. There will definitely more to report soon and pictures to come shortly, so stay tuned to the class website as I continue my journey! Thanks for all of the support so far! 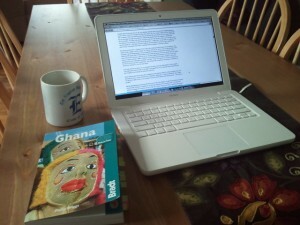 With 8 days left until my departure, I'm writing to update on my trip to Ghana. From my extensive research and reading, I have decided on focusing on the time period of 1650-1800 in present-day Ghana. The main objectives of the trip will be document through film and photography the forts and castles that were built along the coast during this time period to accomodate the multitude of European and African powers that participated in the Atlantic slave trade. To read more about the goals of the trip, see mrvalenzuela.com/ghana. With the airfare purchased (for an August 10th departure) and the visa application sent to Washington, DC, Mr. V can finally begin planning the details of his educational journey to coastal Ghana as part of his Fund for Teachers grant awarded to him this year. 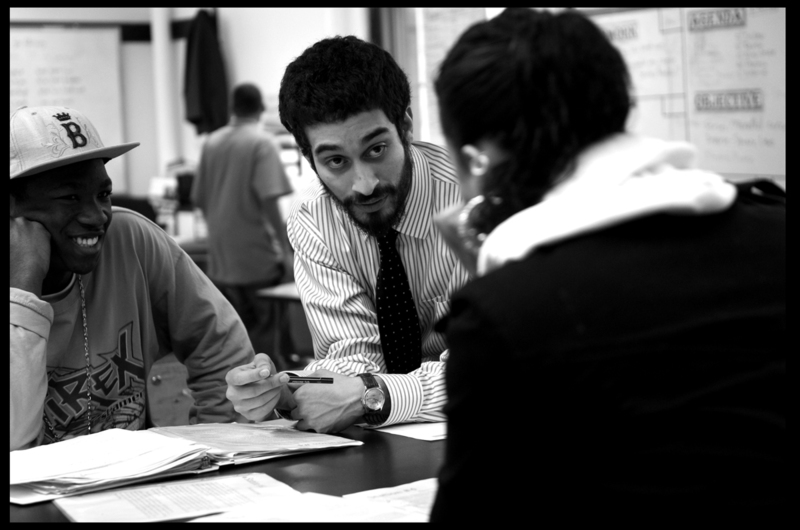 Make sure to follow all of the planning here at mrvalenzuela.com to see the latest on what Mr. V is up to! You can also check out the Ghana page (by clicking on the "Ghana" button on the top menu) to find out more details on the trip. 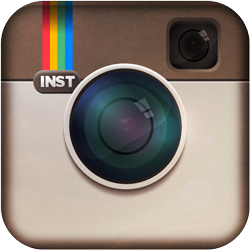 I will be uploading pictures, video, and more on this page!